Does the movement help poor communities? 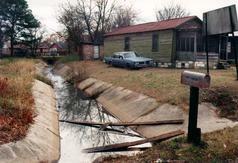 Contaminated drainage ditches run through the largely African-American Hyde Park neighborhood in Augusta, Ga. (Photo Credit: Environmental Resource Justice Center) June 19, 1998 The CQ Researcher Pages 529 - 552© 1998, Congressional Quarterly Inc. All rights reserved. Toxic-waste dumps, sewage-treatment plants and other pollution sources rarely are found near middle-class or affluent communities. Inner-city neighborhoods, rural Hispanic villages and Indian reservations are far more likely to suffer. But a burgeoning new movement is helping poor communities across the country to close the door on unwelcome dumps and factories. Charging that they are victims of environmental racism, activists are winning court battles on the ground that siting polluting facilities among disadvantaged people violates Title VI of the 1964 Civil Rights Act. But business representatives and residents of some affected minority communities say that the movement is stifling their opportunities for economic development and growth.